“Every man prays in his own language, and there is no language that God does not understand.” So Duke Ellington said, and the thought captures the spirit of the three Sacred Music Concerts that he premiered in 1965, 1968, and 1973, and that were the culmination of the last, liturgical phase of his life’s work. 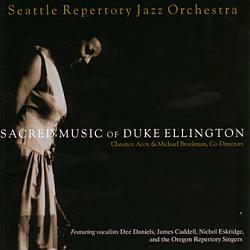 The tradition of performing the Sacred Music of Duke Ellington in Seattle began in the winter of 1989. In a sense, the SRJO began with that first Concert. Many SRJO founding members, including Michael Brockman and Clarence Acox, but also Don Lanphere, Floyd Standifer, Bill Ramsay, Marc Seales and others were integral to the first few years of the concert’s presentation, and were drawn together because of the concert. In the ensuing years, the band won multiple awards for its concerts, it’s first recording – SRJO Live, and in 2005 was named Best Northwest Acoustic Jazz Ensemble at the annual Earshot awards in Seattle.